I didn't know that I liked J.M.W. 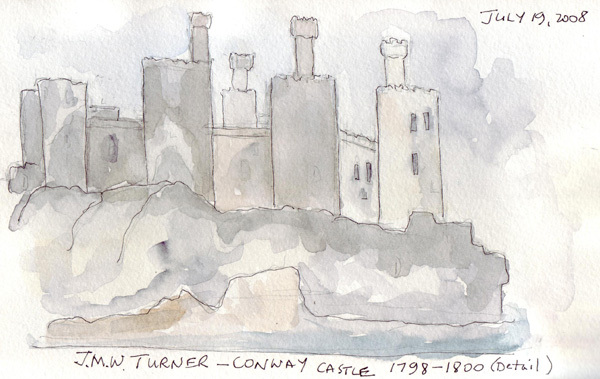 Turner until I saw the Tate Britain "Hockney on Turner" exhibit of his watercolors last srping. Now I'm really enjoying the Turner exhibit at the Met. This is one of the few blockbuster exhibits at the Met in which sketching is not prohibited, so I try to quickly sketch one watercolor each time I visit and paint it later - trying to stay loose. There are three complete rooms of watercolors interspersed among galleries full of his large oil paintings. 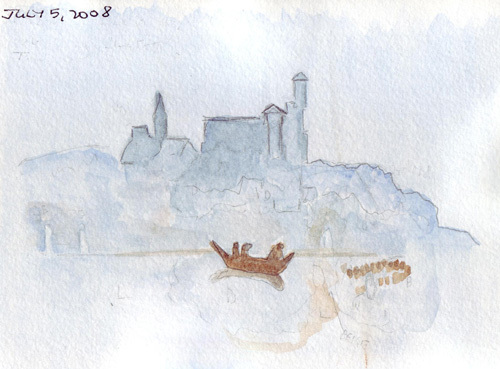 He has a very precise, very tight style in the early works in the first watercolor gallery. then a looser style in the second, and mere impressions of a burning Parliament in the big series of the fire in the third gallery. Here are 4 small sketchbook paintings I did over the last few weeks. Inspired by The Burning Houses of Parliament: 1834 I originally painted this for the cover of my big Reference Photo DVD, but decided to collage it into my sketch book. 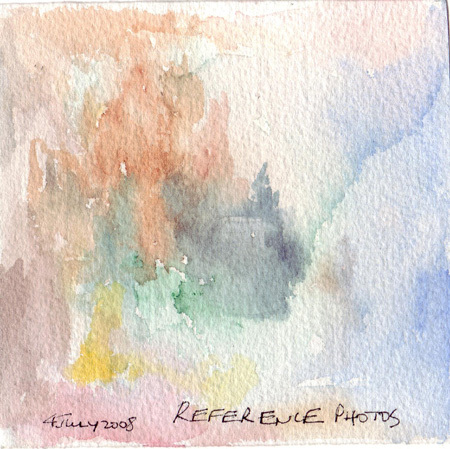 Lori and I sketched several Turner watercolors on our sketchcrawl on Saturday - and I just painted mine. My New Friend: Last Saturday I spent 6 hours on a sketchcrawl at the Metropolitan Museum of Art with Lori - an Everyday Matters Yahoo art group member that I only previously knew through her blog and email. I have thoroughly enjoyed every day spent with members from our wonderful group and love putting a face to a name - as well as holding their sketchbooks in my hand and watching them work. We met for breakfast at a local restaurant and then escaped from the New York City heat at opening time of the Museum. We started at the Turner exhibit - I LOVE his watercolors and this was my 3rd time to visit them this month. 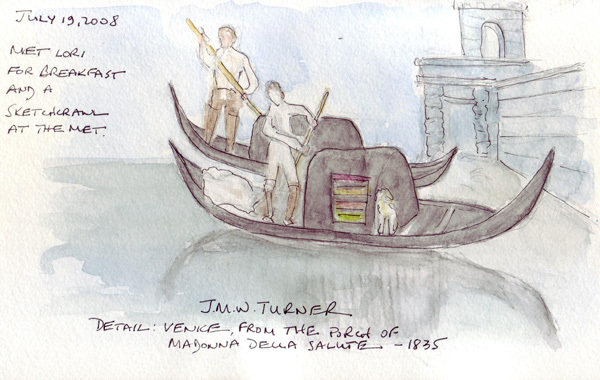 We sketched from Turner and then sat at the table containing the HUGE books from the exhibit and added some water to our pencil sketches with our water brushes (only pencils are allowed in these exhibits if they even let you sketch at all!). We were so cold by the end of the exhibit, we went up to the Sculpture Roof Garden to see the Jeff Koons sculptures and warm up. We then toured the section featuring African, Central and South American artifacts and each sketched different masks and ceramic figures. After lunch in the Museum cafeteria and lots more talking, we ended the day in the 19th C. European painting galleries. 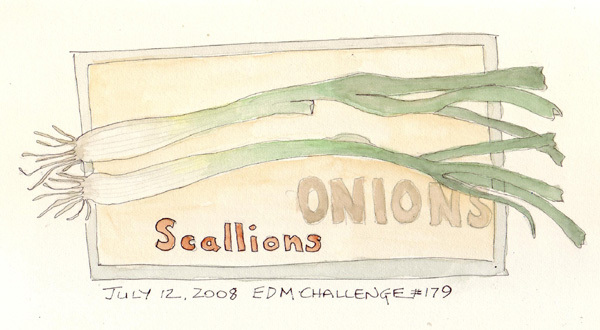 I now have 6 journal pages to finish, converting quick sketches in pencil into ink/watercolor wash drawings. 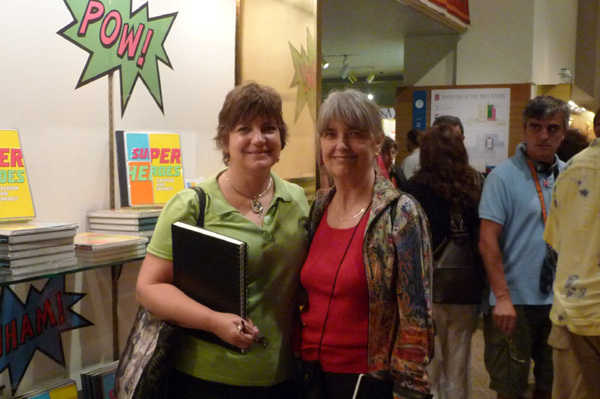 Lori, who is in NYC on an art grant, still had several more days of lessons and experiences. 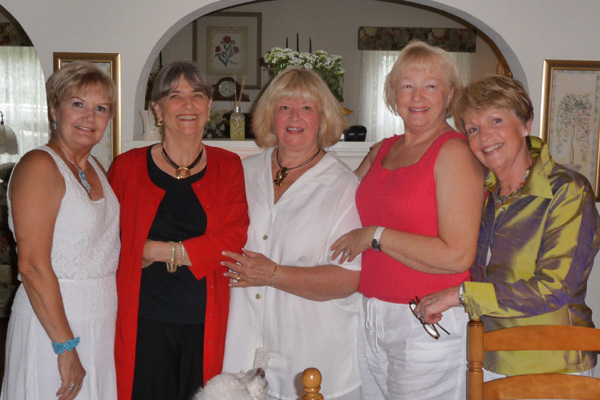 My Old Friends: After leaving Lori, my husband and I drove to my hometown in Northern NJ for dinner with my oldest friends - 4 women who I first met in elementary school. Our 6th group member lives in Florida and we secretly were hoping that she was going to arrive and surprise us! Even my 7th grade homeroom teacher - and our high school class advisor - joins us for these dinners! 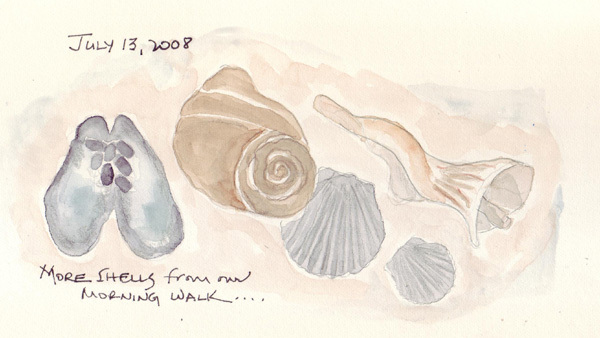 I gathered stuff from the beach during our walks and sketched them later. 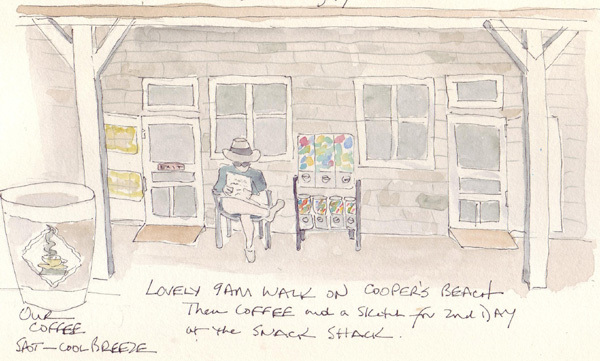 I also tried to sketch at the Snack Shack each morning when we were having our morning coffee in the nice cool breeze. This is a sketch of the front doors to the food area - and the same man was in his chair reading the newspaper 4 mornings in a row. 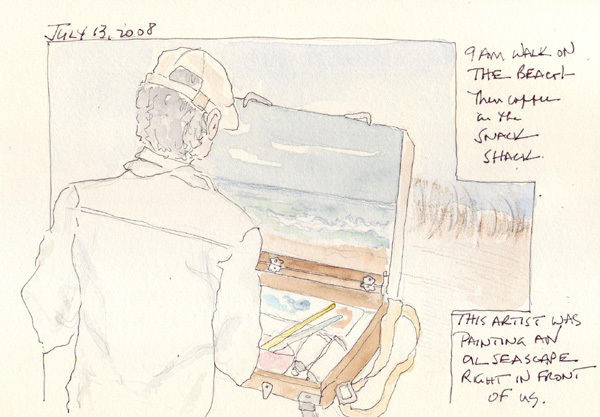 One morning we sat at a table behind an artist who was painting the ocean view in oils. I'm not sure that he even knew that I sketched him. Every morning the beach was different. 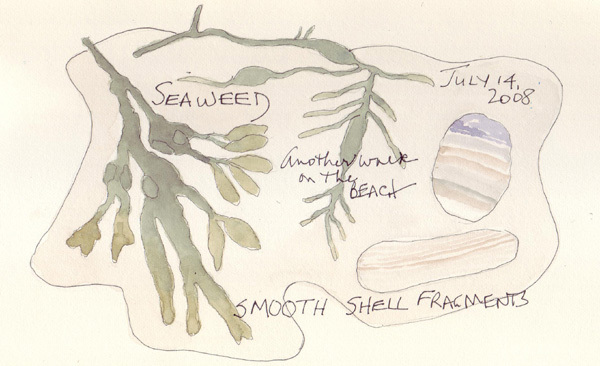 We were amazed that the types of shells varied each day - and on our final morning there was seaweed for the first time and only smooth shell fragments and small rocks. 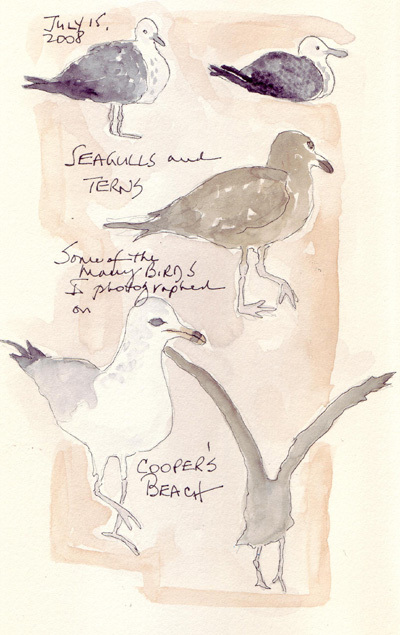 Seagulls and Terns kept us company on our walks. I took lots of photos of them with my zoom lens because they wouldn't let us get very close. The photos were used to create this page. 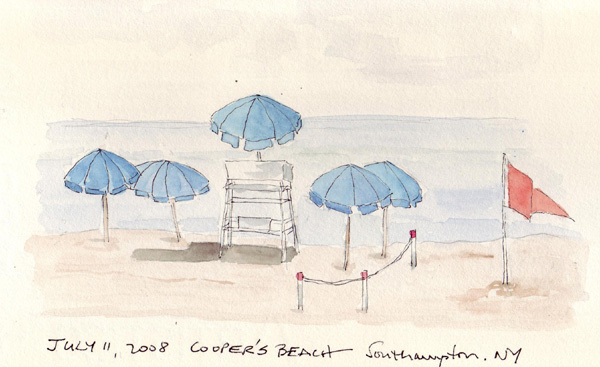 We spent a long weekend in Southampton - and I used one of my recycled books as a travel sketchbook. 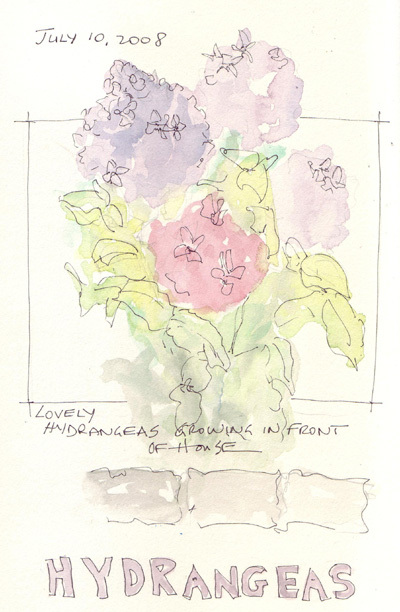 There were gorgeous hydrangeas in bloom everywhere and I tried a quick painting of several blooms. We love walking on the beach and quickly established a daily routine. 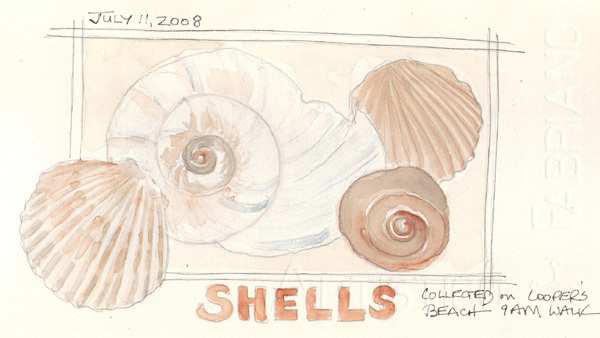 Each day we took a long walk on the beach, picking up shells as we went, followed by morning coffee on the covered patio at the Snack Shack. Just as the beach was getting hot, we were able to move into the shady, cool ocean breeze. 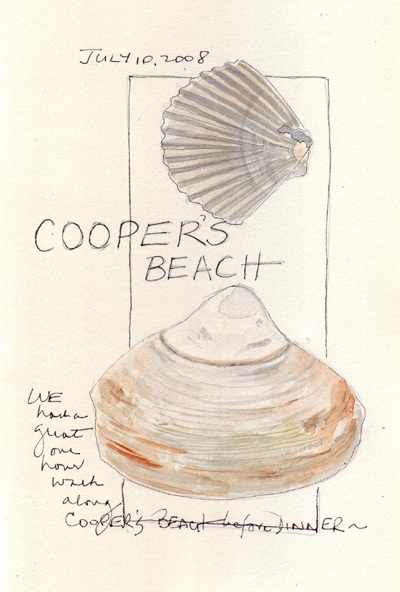 I wanted to continue figure sketching practice, but didn't have any ready models on the beach the first two days - so I sketched from an ad in a Hamptons magazine. We definitely didn't see her on our walk! 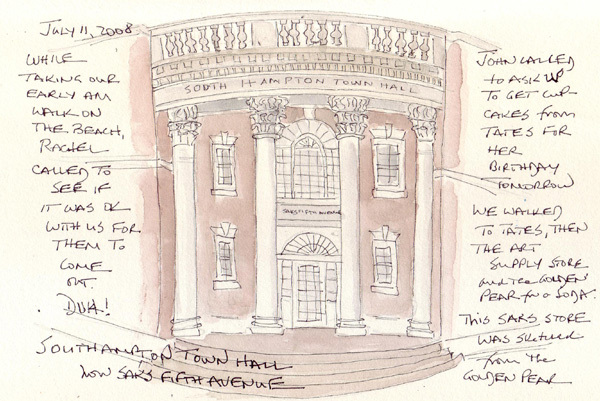 We walked into the Village during the afternoon and from an outdoor cafe I sketched the old Southampton Town Hall building which is now Saks Fifth Avenue. We just returned from a long weekend, mini-vacation at the beach. I wanted to upload last week's challenge as soon as I returned home and then will more slowly post some beach sketches.